… that the nation has transformed from a domestic economy into a global economy. Continued growth of the global economy translates into greater intermodal and domestic freight volumes. These volumes are concentrating in key hubs (very often in major metropolitan areas) and are distributed from these hubs via a network of highway and rail services. In a short haul corridor, these escalating levels of freight are predominately carried by trucks, on the same highway corridors where there is increased personal travel (expressed in vehicle miles traveled (VMTs), and creating levels of compound congestion on highways. These VMT levels are growing at rates which cannot be sustained in a continued growth scenario. As more industries shift towards containerizing their goods, congestion and cost arising from the increase in intermodal traffic will demand partnerships among rail carriers, truck and ocean carrier. However, even though rail intermodal traffic has continues to grow, intermodal terminals are being closed, consolidated and relocated. These on-going restructuring efforts are mainly due to rail mergers, line rationalizations and efforts to increase operating efficiencies, but often leave smaller secondary markets stranded without any reliable intermodal service. Short haul intermodal services, generally defined as rail moves between 200 to 1,000 miles, like any other services, are driven by performance and cost. In the past, lack of rail density, expensive terminal costs, competitive highway service, costly container lifting equipment and rolling stock availability have kept short line rail carriers from offering intermodal services. However, given current trends in the trucking industry, continued closure of rail intermodal terminals, and developments in new rail technologies, distances as short as 130 miles can be successfully served by rail4. In a recent survey5 of more than 4,000 trucking executives, the American Transportation Research Institute revealed that driver shortage was the greatest concern amongst truck operators. Driver availability combined with high and unpredictable diesel fuel prices, new hours of service regulation, driver retention problems, increased congestion, high tolls and environmental issues increase truckers’ costs and restrict their ability to add capacity. Can shippers in short haul, low density markets realize the benefit of rail intermodal services? How do current intermodal technologies benefit short haul shippers? A successful rail intermodal service requires several elements, including sufficient freight to justify the service, access to rail services between the origin and destination, and an intermodal marketing company or logistics service to manage the service for the shipper. Clearly, a shipper has to realize lower costs than obtained by traditional trucking alone. The rail service provider and the intermodal operator, including terminal sub-contractors, all want to have profitable contributions. Rail Length-of-Haul (LOH), rail rates, rolling stock costs, terminal costs and dray charges at origin or destination all contribute to door-to-door short haul shipping costs. Typically rail costs are 30% of highway costs, but this advantage can be eroded in short-haul situations. A fundamental question is whether or not current intermodal technology can offer advantages to short-haul or low-density markets. Three methods available for short haul shipping include multi-unit well cars, multi-purpose 89’ flat cars, and RailRunner® bi-modal technology. 3-Unit Well Car: The 3-unit well car, a typical example of multi-unit well cars, is approximately 203’ long and weighs about 45,500 lbs. It is designed to carry six to nine shipping containers in a double-stack configuration. All well car operations require specialized container lift equipment at either end, used for changing the container transport mode from rail to road, or vice versa. Lift equipment can be in the form of large gantry cranes or reach stackers. In addition to the lift requirement, terminal surface preparation, required to accommodate the heavy lift equipment, is costly and can only be justified with rail density in excess of 50,000 containers per year. For smaller operations, asset management becomes a challenge, impacting efficiencies and the ability to offer a cost effective, reliable service. Overcoming these asset management challenges requires spare equipment at an additional cost to the shipper. Multi-purpose 89′ Flat Car: The multi-purpose 89′ flat car weighs approximately 70,000 lbs., is designed to carry break bulk commodities, trailers (TOFC) or containers (COFC). This railcar carries one or two containers in a single stack configuration. Operating costs and challenges, for the flat car, are similar to that listed for well car operations – heavy container lifting equipment, costly surface preparation and a need for spare equipment all contribute to operating costs. RailRunner: RailRunner products vary in weight and length, and depends on whether a 53’, 40’ or 20’ shipping container is being transported. The weight ranges between 22,900 lbs.and 27,900 lbs. and length varies from 33’ to 56‘ for each railcar assembly. RailRunner chassis are designed to carry one container in a single stack configuration connected to RailRunner bogies; and in this configuration, RailRunner has the ability to switch transportation modes, from rail to road, or vice versa, without the need for heavy container lift equipment. This switch of transportation mode can be preformed on relatively inexpensive dedicated terminal, or on remote rail sidings or spurs that have been level graded. 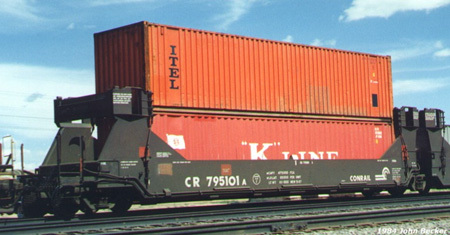 In order to fully appreciate their relative efficiencies, it is necessary to evaluate each type of intermodal railcar operation by considering its line haul costs, lift expenses, equipment and rolling stock costs, terminal requirements, surface preparation costs and other factors over annual container transaction volume. This asset optimization study concludes that competitive short haul rail intermodal services can be provided for short haul and low density markets most effectively with RailRunner technology. The following sections support this conclusion in direct comparisons of Well Car and Flat Car operations to RailRunner-based service. Capital Cost Comparison: Capital cost comparison – A 3-unit well car capital cost is typically less expensive, per container payload than RailRunner bogie and chassis combinations because well cars are a double-stack technology while RailRunner is a single stack technology. Rail Operating Cost Comparison: Line-haul costs of a 3-unit well car train, when compared with a RailRunner train carrying the same number of containers, has slightly less trailing tonnage and may offer marginal efficiencies in train running costs. These weight efficiencies may be offset by higher aerodynamic drag on well-cars, which increase relative fuel consumption on RailRunner trains. Assuming the same number of containers for each train, a double-stack well car train is shorter than a RailRunner train, allowing for the development of smaller terminals with shorter track. Intermodal Operating Comparison: A well car must be loaded or unloaded at a terminal that has container lift capabilities. These lifts, whether gantry crane or reach stacker, are expensive to acquire, operate and maintain, and can only be cost efficient in terminals with high container volume throughput. In addition, terminal surface preparation required to accommodate heavy container lifts is more expensive than the surface required for a RailRunner operation. A RailRunner operation does not require any lift or costly terminal surface preparation, and can be operated at a dedicated terminal or any siding or spur that has a level grade. General: It should also be noted that well car operations are limited to railroads that have double-stack clearances, which are not always available in short haul lanes. Way clearance costs can add significantly to intermodal costs in double-stack lanes. Costly investment in lift equipment and terminal surface preparation for a well car operation, paired with the added lease cost of marine chassis needed for drayage, creates high unit costs in low-density markets. In such markets, RailRunner’s solution is demonstrably more favorable. Product-to-Product Comparison: Product-to-product comparison – A multi-purpose 89′ flat car, like RailRunner, carries containers in a single stack configuration. 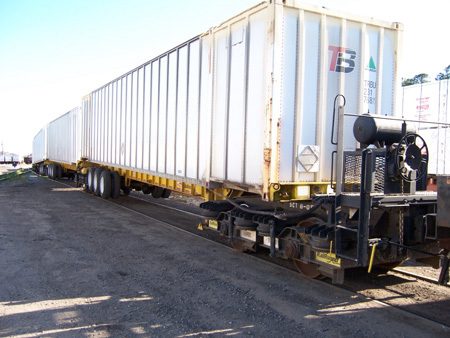 The capital cost of a typical 89′ flat car is greater than RailRunner’s bogie/chassis combination, but as a flat car usually carries two or more containers, its per container capital cost is lower than RailRunner’s per container capital cost. Rail Operating Cost Comparison: Line-haul costs of a multi-purpose 89′ flat car train, when compared with a RailRunner train carrying the same number of containers, has similar in length and trailing tonnage and therefore, has comparable efficiencies in train running costs. A flat car train, with its single stack capabilities, is approximately the same length as a RailRunner train, requiring development of similar terminals and terminal track lengths. Intermodal Operating Comparison: An 89′ flat car, as per the well car, must be loaded or unloaded at a terminal that has container lift capabilities. These lifts, whether gantry crane or reach stacker, are expensive to acquire, operate and maintain, and can only be cost efficient in terminals with high container volume throughput. In addition, terminal surface preparation required to accommodate heavy container lifts is more expensive than the surface required for a RailRunner operation. A RailRunner operation does not require any lift or costly terminal surface preparation and can be operated at a dedicated terminal or any siding or spur that has a level grade. General: Costly investment in lift equipment and terminal surface preparation for a flat car operation, paired with the added lease cost of marine chassis needed for drayage creates high unit costs in low-density markets. In such markets, RailRunner’s solution is demonstrably more favorable. Optimal utilization of rail and terminal assets is critical for successful intermodal operations. Optimal utilization is only possible if the right assets in the appropriate quantities are deployed for according to market requirements. We performed several studies to determine where deploying assts used with RailRunner offers a better solution than deploying the assets used with 3-unit well cars and multi-purpose 89′ flat cars. The objectives of our analysis are summarized in Table I Study Objectives below. In order to effectively model the circumstances required for comparison, initial assumptions have to be made about rail operating conditions, rolling stock deployed and terminal assts and infrastructure built or acquired. The terminal assumptions are shown in Table II below. In the models, rolling stock units are determined by train length and frequency; train frequency required to generate the appropriate number of annual payloads. When a train length limit or frequency limit is reached, a second consist may be utilized. Table III Rolling Stock Assumptions for 3-Unit Well Cars, below, summarizes these details for different total annual payloads. Similarly, decisions must be made about RailRunner rolling stock. Since payloads per unit length in RailRunner are lower than in a double-stack train, RailRunner requires more consists per time interval to deliver an equivalent number of annual payloads. This is outlined in Table IV below. 89′ Flat Cars are of a similar density per unit length as RailRunner, so for a given maximum length train, the number of consists required to achieve an equivalent number of annual payloads will be quite similar to RailRunner. This is clearly indicated in Table V Rolling Stock for 89′ Flat Cars. A rail-cost (line-haul cost) Excel model was developed based on the work of Casgar, et al.6 in the FIRE report, using variables derived from train lengths, average payload weight, cars per train, trailing tonnage, etc., one can estimate the cost and, if necessary, the retail rate for total train operation. The FIRE report has allowances for switching time, maintenance of way costs, fuel consumption and other operational variables. The Excel model has been updated to include current market conditions. Figure 1 Line Haul Cost, RailRunner vs. 3-Unit Well Car shows that the line-haul cost of RailRunner and a 3-unit well car are close, with the principal variation arising when additional consists are added because of the lower density of RailRunner. Under 50,000 units per year, the line-haul costs can be considered equivalent. Another variable is the use of additional power as trailing tonnage crosses certain boundaries. Table VI shows how locomotives are deployed for each type of train as its number of units, and hence trailing tonnage, increases. Additional power means additional operating cost and capital amortization, which along with other related variables are included in the model. Both the total cost and operating costs have been calculated for each type of terminal and applied to the overall model. The costs were then amortized over their useful lives, and their annual depreciation was further amortized over each level of annual payloads to spread the fixed cost over each payload. Equipment: Capital lease, amortized at 10% funds rate over useful life. Rolling Stock: Capital lease, amortized at 10% funds rate over useful life. Transport Surfaces: Capital lease, amortized at 10% funds rate over useful life. Direct Labor and O/H: $20/hr; 50% O/H, estimated to actual men and hours of time per payload. Terminal Models: RailRunner developed, but with reference to accepted operating standards. Costs modeled at capacity of 50,000 containers per year. No cranes employed at terminal, only reach stackers. If cranes were employed, overall infrastructure costs for double-stack terminals would be much higher. All analyses (equipment, rolling stock, surface prep, and labor) are presented in terms of cost only. No gross margins or profits are added. Rail costs include a 50% gross margin for rail operators. No maintenance cost for rolling stock. Figure 2 Fixed Costs Comparison RailRunner vs. Well Car above shows a comparison of a RailRunner terminal fixed cost per payload to a double-stack or flat car terminal as a function of annual payloads. Clearly, the lower RailRunner investment cost favors RailRunner at less than 50,000 payloads per year. Figure 3 Total Cost RailRunner vs. Well Car shows RailRunner’s advantage below 50,000 annual units. For heavier payloads, the crossover point moves to the left because more RailRunner consists are required. For lighter payloads, the crossover point moves to the right. Since there are no assumptions about absorption of clearance infrastructure costs (the cost of raising bridges and tunnels for double-stack) in the fixed cost model, most railroads will show a much higher fixed cost component. In practice, if the route is not set up for intermodal, this cost (often huge) must be added and would shift the crossover point to 100,000 units per year or more. If the investment has already been made, adding the burden is an accounting judgment. Figure 4, above, shows the comparison of line haul cost between RailRunner and 89′ flat cars. Again, variations occur at consist boundaries. Clearly, RailRunner line haul cost is lower than flat car cost over the entire operating range. Terminal infrastructure and operating costs for flat cars are essentially the same as those of well cars. The costs are dominated by reach stackers (or cranes, not used in this analysis) and ground preparation. Ground preparation is expensive due to the heavy axle forces induced when loaded containers are lifted to be place on cars or on yard stacks. Double-stack well cars produce efficiency yields because of the additional payload in each unit of rolling stock and because of advantage in train length economy. Flat cars offer neither of the advantages of double-stack and all of the cost. This is clearly shown in Figure 5 where there is a clear RailRunner advantage over the entire range of annual payloads. This advantage is maintained over any range of payloads, even beyond 50,000 per year. In North America, on lanes that have not been cleared for double-stack, RailRunner is clearly advantageous over flat cars in most cases. In most international markets rails are electrified in all or in part, and double- stack is rarely used. Figure 5 Total Cost RailRunner vs. Flat Car indicates that RailRunner has a striking advantage in those markets as well. In many of those markets product homologation may be required before operators may seek permits to operate RailRunner. 3-Unit Well Car vs. RailRunner – The study confirms that it is possible to establish a cost effective and efficient short haul, rail served intermodal service. Although well car per payload capital costs are lower than RailRunner per payload capital costs, and well cars offer certain efficiencies because of its double-stack capabilities, such benefits are negated by the cost of terminal surface preparation and investment in heavy container lift equipment, . Using the RailRunner Terminal Anywhere® System provides a much lower breakeven point than the well car operation. According to Figure 3 Total Cost RailRunner vs. Well Car, showing the total cost per payload, RailRunner is profitable for container volumes ranging between 5,000 and 45,000 containers per year. Multi-purpose 89′ Flat Car vs. RailRunner – Flat cars per payload capital cost are less expensive than RailRunner, but are more expensive than a well car per payload costs. Flat car benefits are negated by the cost of terminal surface preparation and investment in heavy container lift equipment, which is similar to that required for well cars, This model creates an even stronger case for the RailRunner technology and, as shown in Figure 5 Total Cost RailRunner vs. Flat Car, the total cost per payload for RailRunner is lower across the entire annual volume range. 3 “Rail Short Haul Intermodal Corridor Case Studies”, Foundation for Intermodal Research & Education (FIRE), Casgar, C.S., DeBoer, D.J., and Parkinson, D.L., March 2003. 6 “Rail Short Haul Intermodal Corridor Case Studies”, Foundation for Intermodal Research & Education (FIRE), Casgar, C.S., DeBoer, D.J., and Parkinson, D.L., March 2003.